I wasn’t sure what I wanted to do with my life after high school besides travel the world. With that dream not being a possibility yet I decided to pursue a career in something I enjoyed. My folks encouraged me to look in to art schools. It would not be long until I found myself attending a prestigious university on Canada’s east coast. That summer of '94 I left my hometown in central Canada for the Maritimes. When I arrived I instantly fell in love with the ocean; it was like I had come home. I couldn’t have known it at the time, but the ocean would become a central theme in my life. As much as I loved art, conventional schooling was not for me. After several years of work, travel, and the gaining of valuable life experiences, a chance encounter led me back to art. Shortly afterwards I began teaching myself to oil paint and knew that this was the path I was meant to follow. I decided to start working towards making painting a sustainable career. 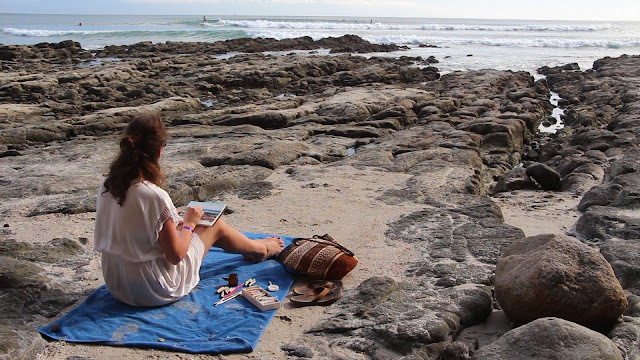 These days I live, work and play by the ocean, filling my time with painting and teaching art. I feel that we are all innately creative and I encourage students to set aside their fears and insecurities, to relax, have fun and not take themselves too seriously. Seeing the joy art brings to people fuels me to continue on this amazing path and inspire others to also seek fulfillment out of life. Copyright © Daina Scarola, Ocean Art Studio. Simple theme. Powered by Blogger.